Pelargonidin is one of the six anthocyanin compounds, and is both the simplest in structure and is red. It is commonly associated with strawberries, although it is present in all berries. Seems to have its bioactivity saved by Quercetin. Our evidence-based analysis on pelargonidin features 19 unique references to scientific papers. Pelargonidin is the simplest of the Anthocyanins in structure. You are now following Pelargonidin. You will be notified when any significant update is made. There is insufficient evidence to recommend pelargonidin as an isolated supplement, and it would be more beneficial to get this anthocyanin through food products in the red pigmentation range; strawberries are the largest known source. Pelargonidin is the simplest of the Anthocyanins as it does not have any additions to the two possible side-chains (see Anthocyanins page for explanation). It is found in various foods in the anthocyanin spectrum, but is found in relatively high levels in strawberries. While Pelargonidin aglycones appear to be rapidly degraded or conjugated (via glucuronides), the common food bound form Pelargonidin-3-Glucoside appears to be stable in a model of human digestion. Oral bioavailability of Pelargonidin appears to be 18% when measured after two hours. It is essentially cleared from the body 18 hours after ingestion, although p-hydroxybenzoic acid (a metabolite) persists. This particular study used 50mg/kg bodyweight Pelargonidin in a 50% aqueous ethanol solution. Food sources of Pelargonidin may not be as bioavailable as the former (isolated form) as one study in humans found that urinary levels after 24 hours accounted for 0.9% the oral dose. Despite the above, some authors suggest that Pelargonidin has the highest absorption rates of all anthocyanins. Consuming Pelargonidin (from food sources) alongside a fat source does not appear to increase overall amounts of Pelargonidin absorbed, although it delays the time it takes to absorb by slowing gastric digestion. One study in rats found that, after pelargonidin gavage (directly into gut through mouth) that pelargonidin was detectable in brain and lung tissue as itself at around 0.16nmol/g, and was detectable in serum, lungs, and kidneys as pelargonidin glucuronide. Pelargonidin is subject to P450 enzymes in the liver, and primarily exists in plasma as Pelargonidin Glucuronide. This has also been found in humans after consuming Pelargonidin containing foods. Some sulfate conjugates (Pelargonidin Sulfate) have been noted with urinary excretion although they are insignificant enough to sometimes not be recorded. Colonic production of p-hydroxybenzoic acid, a ring fission product of pelargonidin, has been noted in plasma 2 hours after oral ingestion and accounting for 44% of the oral dose. Direct conversion has been noted, but also indirect breaking to p-hydroxy propinoic acid with subsequent B-oxidation to p-hydroxybenzoic acid. 18 hours post ingestion, this is the only metabolite of Pelargonidin present. Pelargonidin, when fed to rats (10mg/kg bodyweight) after a diabetic toxin, was able to mostly alleviate the progression of hyperalgesia over time; multiple doses were able to reduce markers of oxidation, indicating anti-oxidant capabilities. Anti-oxidation was also seen in an I.V study (3mg/kg bodyweight) as levels of superoxide dismutase and catalase (endogenous antioxidant enzymes) were restored in diabetic rats. Anti-oxidative effects at 10-20mg/kg bodyweight have also been implicated in neuroprotection. 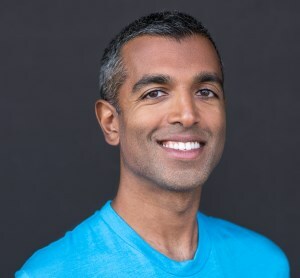 Injections have been shown to reduce blood glucose levels and increase serum insulin, and subsequently reduce the amount of hemoglobin glycation that occurs. Contrary to the above, one animal study noted that freeze-dried berry extracts seemed to promote weight-gain when given through an obesogenic diet, whereas a purified anthocyanin mixture had the expected triglyceride lowering results. In adult humans, the addition of Pelargonidin (as Strawberries) to a meal was able to decrease the post-prandial (after meal) inflammation and insulin spike. From strawberries, there appears to be a linear response for absorption. This may be due to, in part, Pelargonidin's ability to prevent glucose uptake into the intestinal wall. One study put forth using Strawberry Extract, mostly consisting of Pelargonidin and its glycosides, was able to protect human skin cells in vitro from UV(A) rays and less DNA damage at concentrations from 0.05mg/mL to 0.5mg/mL . 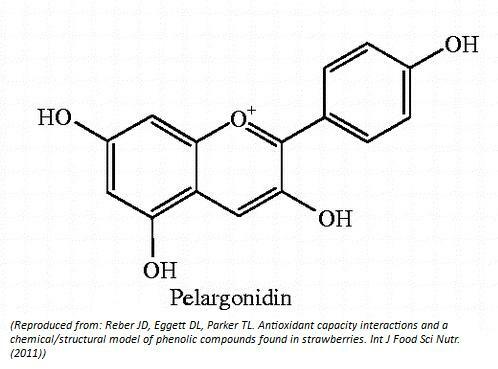 One study, when investigating phenolics in strawberries and how they interacted with each other found that Pelargonidin reduces the anti-oxidant potential of the (normally) synergistic mixture of p-coumaric acid and catechin, explained by the large amount of Pelargonidin present sequestering electrons being donated from catechin to p-coumaric acid. This study used concentrations found in strawberries, and not 1:1 ratios. Pelargonidin was also noted to act antagonistically with Cyanidin aglycones and with p-coumaric acid alone. However, when paired with Quercetin these latter two antagonisms were reversed into a synergistic relationship, due to Quercetin's lower reduction potential relative to Pelargonidin. ^ Photoprotective Potential of Strawberry (Fragaria × ananassa) Extract against UV-A Irradiation Damage on Human Fibroblasts.